Tom Woodruff was a league-leading base stealer his first two years in the minors. Five years later he was inflicting heavy damage on Japanese shipping as a US Navy fighter pilot roaming the Pacific from the deck of the USS Enterprise. After earning a string of awards for extraordinary heroism against the enemy, Tom's luck ran out in November 1944. The 22-year-old began the 1940 season with the Springfield Browns of the Class B Three-I League, playing alongside future major leaguers Ray Coleman, Earl Jones, Ed Busch and Len Schulte. But after batting only .248 in 55 games he joined the St. Joseph Autos of the Class C Michigan State League on July 9. Bringing outstanding speed on the basepaths and combining with manager Elmer Kirchoff to make a neat double play combination, Woodruff helped put the Autos on a winning streak. In 27 games, he was batting .404 and had stolen 17 bases when he broke his leg in a game against Grand Rapids in August. But despite his limited playing time he was voted to the Michigan State League All-Star team picked by the loop's sports editors and team managers. Woodruff began his military life at the Army Replacement Center at Jefferson Barracks, Missouri, where he was attached to the public relations staff, having studied journalismn at St. Louis University. He later transferred to the Navy and as an aviation cadet, trained at Pensacola Naval Air Station, earning his wings as a fighter pilot in June 1942. 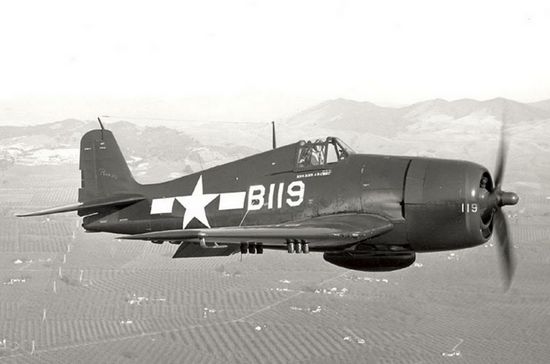 Lieutenant Junior Grade Woodruff flew the Grumman F6F Hellcat, and saw action in the Pacific from August 1944, as part of Fighter Squadron VF-20 aboard the USS Enterprise. He made fighter sweeps over the Bonin Islands, Yap Island and in support of the landings at Peleliu in September. In October, strikes were made against Okinawa, Luzon and in support of the Second Battle of the Philippine Sea. Woodruff was awarded the Distinguished Flying Cross, Air Medal and Navy Cross for his aerial combat achievements. During November, he made attacks against land targets in the Philippines and enemy convoys including the November 11 attack on an enemy convoy at Ormoc Bay. On that day, the Navy pilots encountered stiff opposition from ant-aircraft fire but sank two destroyers. On November 14, 1944, he flew a mission against Clark Field in the Philippines that was the most trying for the pilots of VF-20. Anti-aircraft batteries of all sizes had been greatly strengthened since previous strikes and were finding their targets with alarming accuracy. Six fighters were shot down that day, including Woodruff. His body was never recovered and a year later he was officially declared dead. Woodruff was posthumously awarded a gold star in lieu of a second Distinguished Flying Cross for his part in the attack against the Japanese convoy on November 11, 1944. He is memorialized at the Manila American Cemetery at Fort Bonifacio in the Philippines. The President of the United States of America takes pleasure in presenting the Navy Cross to Lieutenant, Junior Grade Thomas Joseph Woodruff (NSN: 0-145682), United States Naval Reserve, for extraordinary heroism in operations against the enemy while serving as Pilot of a carrier-based Navy Fighter Plane in Fighting Squadron TWENTY (VF-20), attached to the U.S.S. ENTERPRISE (CV-6), in strikes against the Japanese Fleet on 24 - 25 October 1944, east of the Philippines. On 25 October Lieutenant, Junior Grade, Woodruff participated in a coordinated attack on a large formation of enemy warships and in spite of intense anti-aircraft fire scored rocket hits on a destroyer. On 20 October with complete disregard for his own personal safety and in the face of intense anti-aircraft fire he attacked and obtained a direct bomb hit on a light cruiser inflicting severe damage. His courage and skill were at all times in keeping with the highest traditions of the United States Naval Service. 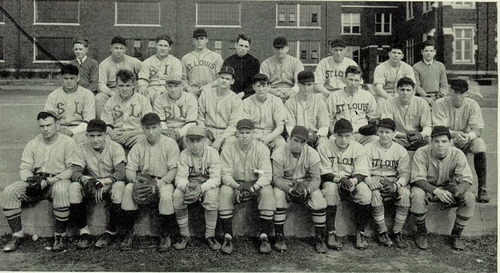 Tom Woodruff (front row, fifth from left) with the 1936 St. Louis University High School baseball team. Future major league, Joe Schultz, is back row, second from left. 2. One of Woodruff's 1939 Paragould teammates was Marshall Sneed, who went on to fly fighter planes with the USAAF in North Africa. Sneed was killed in action in February 1943. 5. militarytimes.com/citations-medals-awards/recipient.php?recipientid=27387. Retrieved May 30, 2012. Thanks to Gary Fink and Joe Patke for help with this biography. Thanks also to Astrid van Erp for help with photos and information. This baseball card of Tom Woodruff was created by Gary Cieradkowski as part of the Infinite Baseball Card Set. It is available for purchase at a cost of $5.00.